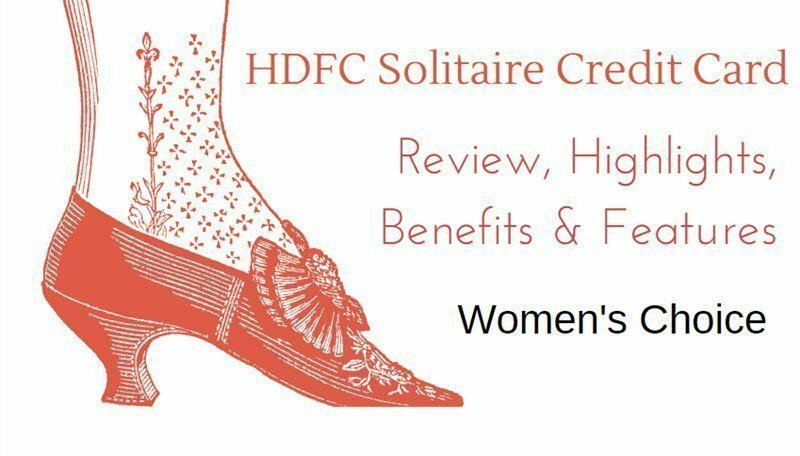 HDFC Solitaire Credit Card basically introduced and designed looking at the women psychology, This card is especially for their female customers. Women are considered as more shopping online offline both. This Credit Card is very attractive features and beneficial for both bank services as well as women customers. - Get ₹ 1000 shopping voucher if you speed ₹ 75000 every six months - 3 Reward Points on multiple of ₹ 150 spent. - Get double 2X reward points on spending on selected restaurants and grocery store. - Every Reward point worth 0.4% of your spending. - For self Employed age 21-65 years. HDFC provides you ₹ 1000 shopping voucher if you speed ₹ 75000 every six months (~₹12500 per month) Not a big deal. You will get 3 Reward Points on multiple of ₹ 150 spent. Redeem your reward points as the outstanding amount of 100 reward points = ₹ 20. If you are making payment for grocery or dining payment from your HDFC Credit Card your reward points are double 2X i.e. you will get 0.8% cash back. 50% more reward point is allowed to the cardholder only if the transaction made on the classified list of Restaurant & Grocery. Restaurants within hotels, Shopping malls, and departmental stores will not qualify for 50% more reward points. Grocery at outlets is also not qualified for 50% more reward points. Transaction amount less than ₹ 150 will not earn Reward Points. Fuel Surcharge Waiver – Get cash back on fuel with a maximum cap limit of ₹ 250 per billing cycle. Enjoy 50 days credit free on your expenditure (Remeber your billing cycle). HDFC Solitaire Credit Card Suppose your billing date is 2nd of March, according to 50 days credit you have to pay the HDFC Solitaire Credit Card bill amount on 22nd April. Now the twist is – If you use your card on 3rd march you will get full 50 days credit period, but if you use your card on 1 March, then your purchase will fall into your bill which will be raised on 2 March, that way you only have 20 days interest-free period. Reward points are valid for 2 years – You have to redeem your point unless they are leps. HDFC Solitaire Credit Card mark up with 3.5% plus GST on foreign exchange. If you are a salaried employee, you can apply for HDFC Solitaire Credit Card with the age limit 21 – 60 years. and If self-employed the age limit 21 – 65 years. Annual fees of HDFC Solitaire Credit Card is ₹ 500 for the first year which is waived if you spend ₹ 10000 for the first years, and ₹ 50000 from the second year to get your annual fee reverse. Enjoy ₹ 2000 shopping from your voucher every year. On your basic annual expenditure of ₹ 5 Lakh from Solitaire Credit Card, get ₹ 2000 cash back. Do 4 transaction from your Solitaire credit card every month and get accident death insurance up to ₹ 50 Lakhs. Get a 40% cash advance facility of your credit limit. Charges 2.5% of the amount withdrawn or ₹ 500 (whichever is less). Conclusion: This card is specially designed for the women, grocery purchase every month and shopping online or offline, in addition to dinning (more less in their kitty-parties). All the segments are covered in this card. HDFC cash back is also a good credit card in this segment.